Sadly, in the world as it is today, problems are not solvable, and elections are but a circus. Hopefully good guys win, whatever party, eventually. We need good people on both sides. Civility is hard to come by in candidate forums right now. Even the city council candidate forum I attended had one person who who was not civil - perhaps because he had very little of substance to say? I wish people would wake up to the fact that corporate tax cuts have never, ever, benefited the poorer segments of society. So let's put that futile claim to rest! DUTA, I'm inclined to disagree, because I'm an optimist. Diane, I'm inclined to agree, because I'm also a skeptic. Interesting, but can you imagine trump or a trump like candidate ever remotely behaving well in a debate? The problem is the president and the precedent he has set over a few years in civil discourse, hate speech, threats, lock her up, body slamming is a good thing and some Nazis are very fine people. The buck starts with him and it will never stop as long as he is president and sets the tone. Olga ... I checked out the video ... amazing! I'm always interested how local political candidates can disagree but still respect each other and work together, but when you get on the national level candidates treat opponents like enemies and insult them and call the names. Why is that? I have voted for both Democrats and Republicans, depending on the politician. This year, I am voting for Democrats. IMO, this calling the other candidate a liar only damages the one speaking (whether he/she is or not). 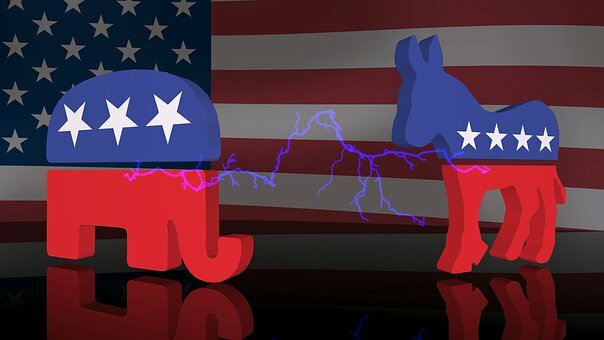 Each party takes something out of context and then says that the other is for or against it... most of us that are listening know that this isn't true. What I agree is a sign of the times is this condemnation of the entire party... which is going to cause many people to vote straight party due to (for lack of a better term "hate" mongers). Can't imagine this situation having a good outcome for our country. And I agree with gigi in that I vote for the man, not the party. I'm afraid that no matter how principled or well-intentioned an individual candidate may be, Washington corrupts completely. Over a short period of time a member of Congress learns that to survive he or she must play the game of give and take. A lone voice of reason in the wilderness is quickly drowned out by the cacophony of politics. Just returning from Arizona, I don't know how people stay sane. SO much noise. Don't they see that they are nearly a pawn? I have been a libertarian for 30 years and still have not seen a candidate who fits my views. I simply hold my nose and vote for the person I think will do the job. Here the amazing thing to me is that even through our Senator has been one of the most liberal in congress, he touts himself as a moderate. Such is life. I don't mind "moderates" as long as they stick to their convictions. Too many have cow-towed to the President to satiate him and are using unfair tactics to push their agenda through. They sound OK on the campaign trail until they don't. Just saying.